Marine ecosystems contain a vast diversity of ecologically influential parasites. Our work aims to identify drivers of marine parasite abundance and diversity and pinpoint ways in which human impacts change these assemblages. In a new effort funded by NSF’s Biological Oceanography program, the Wood Lab is collaborating with Stuart Sandin (Scripps) and Alison Haupt (CSUMB) to build a database of parasites from coral reef fishes of the central equatorial Pacific, suitable for testing a variety of questions about the diversity of coral reef fishes and the transmission of their parasites. As Earth’s ecosystems experience rapid biodiversity change, disease ecologists have turned to an urgent question: how might reductions in biodiversity affect the transmission of parasites? In other words, does biodiversity loss increase the abundance of parasites by eroding natural “checks and balances” on transmission? Or does it decrease parasite abundance by removing the free-living biodiversity on which parasites depend? Answers to these questions are urgently needed if we are to mitigate or prevent an uptick in parasite transmission for ecosystems experiencing biodiversity loss, but debate rages over whether these increases in parasite transmission should be expected at all (see exchanges here, here, here, here, here, here, and here). In part, this dissension arises because we lack the comprehensive, multi-host, multi-parasite, broad-spatial-scale dataset needed to formulate a convincing empirical test. Our team will answer this recalcitrant question, using a dataset of unprecedented replication and taxonomic and spatial resolution, by exploiting the advantages of a marine model system. We are currently undertaking a natural experiment in which we will quantify the abundance of parasites across a highly resolved gradient of biodiversity, for more than 77 parasite species and 18 replicate coral reef ecosystems. 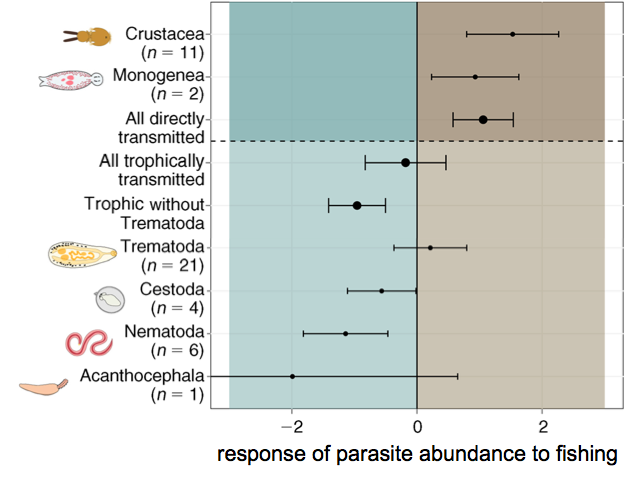 Our dataset will provide a comprehensive view of the biodiversity–parasite abundance relationship, revealing how its direction, shape, and scale-dependence vary across a diverse array of parasite taxa, and resolving questions of burning interest in the disease ecology literature. (Crustacea, Monogenea) and complex life cycle parasites (Trematoda, Cestoda, Nematoa, Acanthocephala). Adapted from Wood et al. 2015. Previous work by our team hints that biodiversity has an important role to play in determining parasite abundance. Our data demonstrate that fishing drives marine parasite abundance (Wood et al. 2013, Wood et al. 2014, Wood et al. 2015). Parasite species with complex life cycles (i.e., those that obligately require more than one host species) decline in the presence of fishing (Figure 1). On the other hand, directly transmitted parasites (i.e., those parasites transmitted among hosts of the same species) can increase dramatically with increasing fishing pressure (Figure 1). Meta-analysis reveals that these outcomes hold for parasites of finfish and invertebrates around the world (Wood and Lafferty 2013). While these patterns are robust, the mechanisms that produce them have not been identified. We hypothesize that the relationship we have observed between fishing and parasite abundance is driven by an intermediary variable: the biodiversity of free-living (i.e., non-parasitic) species. Specifically, we suspect that fishing changes fish biodiversity, and that this change in fish biodiversity influences parasite abundance. Interest in the relationship between biodiversity and parasite abundance has grown rapidly in the past decade, driven primarily by work in terrestrial and freshwater ecosystems. These studies posit a number of mechanistic pathways by which shifts in biodiversity may affect parasite transmission and colonization success. Our project will constitute the first comprehensive test of leading hypotheses for the relationship between biodiversity and parasite abundance in any ecosystem, identifying the conditions under which positive, negative, and neutral biodiversity–parasite abundance relationships are to be expected. Figure 2. Map of study region. Our project exploits the exceptional tractability of marine ecosystems (diverse parasite fauna, ease of collection and diagnosis of vertebrate hosts, strong and continuous spatial variability in host biodiversity, broad scope of spatial scales, biologically realistic sampling units) to address long-standing gaps in the empirical data available to test fundamental disease ecology theory. We accomplish this by integrating an existing, fine-resolution dataset on coral reef fish parasites from six equatorial Pacific islands (Wood et al. 2014, Wood et al. 2015, Wood et al. 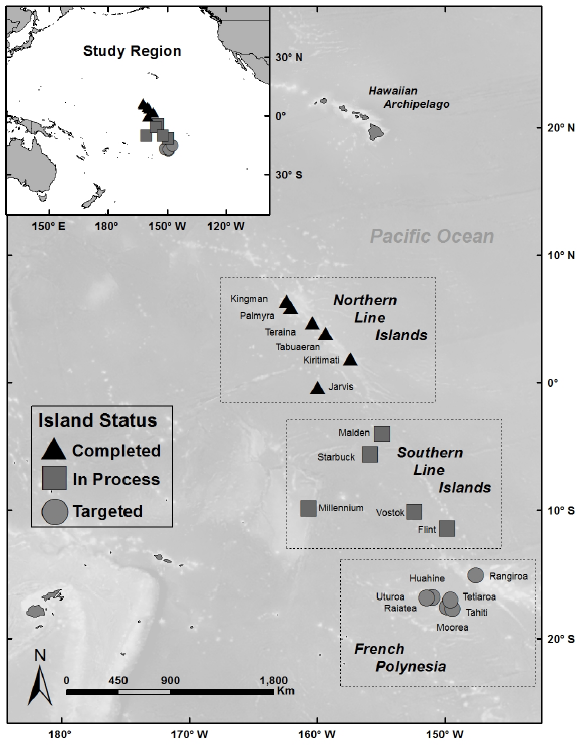 2018) with new sampling from 12 similar, nearby islands (5 Southern Line Islands + 7 islands of French Polynesia; Figure 2). The focal islands vary in the amount of fish biodiversity they support. This natural experiment will allow us to explore how parasite abundance responds to variation in biodiversity at an unprecedented spatial scale, spanning 18 coral islands of three major archipelagos. This work represents a new frontier for biological oceanography. It will answer longstanding questions in disease ecology through the use of a new, highly tractable marine study system, which will enrich the empirical basis for disease ecology theory, inject insights from marine ecology into a literature that is nearly bereft of data from marine systems, and deepen our understanding of marine ecosystem structure and function. The theories we propose to test here are among the most important and controversial in the rapidly growing field of disease ecology; our work represents a novel, creative approach to a recalcitrant research question – an approach that will yield transformative insights into the nature of parasite transmission in a changing world. This NSF-funded project officially launches in October 2018, and we are currently seeking applicants for graduate student and post-doc positions.